Review: I have mixed thoughts on this book but I overall enjoyed it. 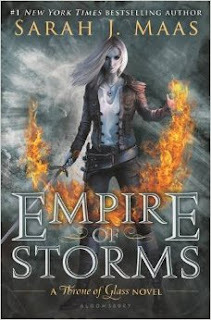 Oddly enough, my least favorite character is our heroine, Aelin. She continues to be an obnoxious know-it-all who keeps almost everything secret from her 'trusted court.' While her interaction with Darrow did not go as she planned, I actually found myself agreeing with several of the things he was saying (as a side note-I'm still wondering where her military and strategic knowledge has materialized from). I like Rowan and don't mind them together, but too much of the book was spent on their love for each other and I found myself rolling my eyes and skimming these sections. Several of the 'big reveals' about their relationship seemed like de ja vu from A Court of Mist and Fury. The MVP's of this book were Lysandra and Manon. Lysandra was simply awesome in this book and I cannot wait to see what happens in the next installment. Manon's story in the first 2/3 of this book was so good I felt like I was strictly reading just so I could get to her sections. Unfortunately, her storyline stalled when she met up with Aelin and too much time was spent on the ridiculous "relationship" with Dorian. Listen, I love romance as much as the next person, but every character does not need to be paired up. Or at least if you are going to pair them up, create some angst. Overall-loved Lysandra and Manon, excited for the final book next year.